On November 23, the Israeli cabinet approved a bill that defines Israel as the nation-state of the Jewish people. Such a draft bill aims to destroy the two-state solution by superimposing “Greater Israel’ on historical Palestine and endorsing the military occupation. Furthermore, it would institutionalize apartheid and deprive the Palestinian citizens of Israel of their social, political and economic rights, turning them into second-class citizens. This bill constitutes a unilateral revocation by Israel of the 1993 Letters of Mutual Recognition. The bill exposes Israel’s manipulation of its very own political and judicial systems to violate international law and conventions that prohibit racism and ethnic cleansing. Such proposed legislation builds upon a long series of racist laws, proposals and practices that reflect Israel’s intent to legalize discrimination and xenophobia against all aspects of Palestinian life, and to provoke the military occupation into a deliberate sectarian confrontation, while inserting an ideological component into official policy. With its insistence on the recognition of the “Jewishness of the state,” Israel is attempting to wipe out Palestinian presence, rights, and continuity on Palestinian lands, and to impose a de facto one-state solution. This bill seeks to exempt Israel from its obligations and responsibilities towards the Palestinian refugees who were forcibly expelled from their homes and to pre-empt their right of return as per UN Resolution 194. In this context, the PLO Executive Committee strongly condemns the dozens of laws enacted since 1948 and the draft legislation that blatantly discriminate against the Palestinians and defy all the basic principles of democracy and human rights. These include: the Ministerial Committee on Legislation’s approval of a bill earlier this month to apply Israeli law to Jewish settlements in the occupied West Bank which will result in Israel’s annexation of the entire West Bank; Israeli Defense Minister Moshe Ya’alon’s October directive forcing Palestinians working in Israel to return home to the West Bank via a single crossing and banning them from riding the same buses as settlers; the Israeli High Court’s upholding of a law in September allowing communities to screen potential members, enabling Jews to reject Palestinian citizens of Israel from residing in them; the passing of an Israeli Knesset bill in February that explicitly distinguishes between Muslim and Christian Palestinian citizens of Israel; and the Knesset’s discussion in February of a proposal initiated by right-wing MK Moshe Feiglin regarding the extension of Israeli sovereignty over the Al-Aqsa Mosque. It should be affirmed that any law or practice that classifies its citizens based on religion or ethnicity is a crude and anachronistic practice that institutionalizes racism and discrimination. The PLO Executive Committee also denounces Israel’s laws and proposed legislation that call for the collective punishment of the Palestinian people. In November, Israeli ministers voted to increase penalties on stone throwers from two to twenty years, and MK Motti Yogev submitted a bill that would decrease the child allowances of the National Insurance benefits of families to half if their children are convicted of a “nationalist” crime. Moreover, the PLO deplores Israel for demolishing the family homes of Palestinians suspected of carrying out attacks on Israelis and nullifying their Jerusalem residency status, and for Israeli Prime Minister Benjamin Netanyahu’s demand to revoke the Israeli citizenship of those Israeli-Palestinians who “call for the destruction of the State of Israel”; such acts are in direct violation of international humanitarian law and constitute war crimes. It should be mentioned that the inordinate speed with which Israel’s bill on recognizing the nation-state of the Jewish people and other pieces of legislation are introduced is proof that Netanyahu and his extremist hardline coalition are waging a malicious campaign of incitement, hate and extreme ideological provocations. They are also designed to manipulate and mislead public opinion and to destroy any chances for peace, while agitating a holy war and generating grave instability and violence throughout the region. The PLO Executive Committee calls on all members of the international community, including the United Nations, the European Union, and the United States, to hold Israel to account immediately, to curb Israel’s violations and deliberate acts of racial discrimination and violence against the Palestinian people, and to support Palestinian efforts to seek justice and protection in all international legal venues, including approaching the UN Security Council to set a timeframe for ending the occupation and establishing the independent Palestinian state on 1967 borders with Jerusalem as its capital. The PLO Executive Committee commends parliaments around the world and their people who have already recognized the State of Palestine, and calls on other parliaments and governments to follow suit and support Palestinian efforts to end the military occupation of Palestine. 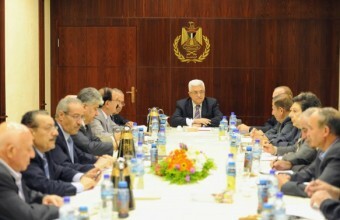 The PLO Executive Committee also pays tribute to the Palestinian people for their bravery, determination, and continued steadfastness and commitment to freedom, and calls on them to achieve full unity and reconciliation to defend their inalienable rights in the face of the belligerent occupier by means of popular non-violent activism, as well as political, legal and diplomatic efforts.